What's covered through Express Drive? What states are covered by this policy? Lyft provides contingent liability coverage to protect you if your personal insurance doesn’t. Our primary liability insurance is designed to act as the primary coverage from the time you accept a ride request until the time the ride has ended in the app. The policy has a $1,000,000 per accident limit. 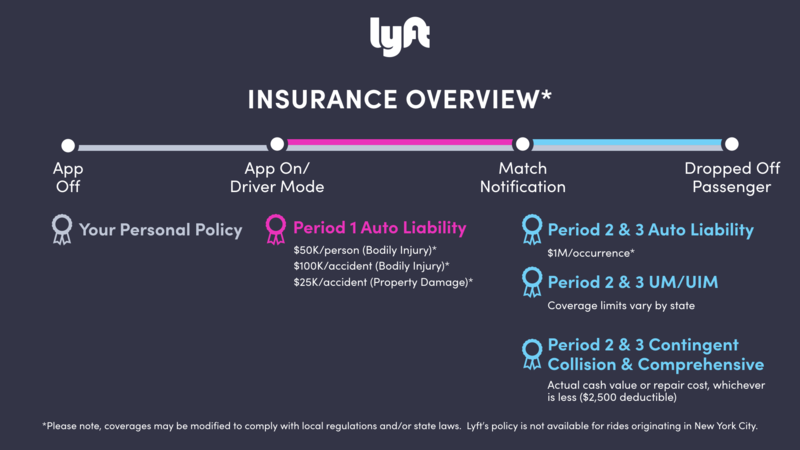 Note: If you already carry commercial insurance (or personal coverage providing specific coverage for ridesharing), Lyft’s policy will continue to be excess to your insurance coverage. In the event of an accident (once you have accepted a ride or are transporting a passenger) with a driver who is uninsured (UM) or underinsured (UIM) and is ultimately at fault for bodily injury caused to you and/or your passengers, our UM/UIM coverage will apply (coverage limits vary by state). There is no deductible on our UM/UIM policy. Waiting for a request: When the app is in driver mode and you have not received a ride request. Ride in progress: This includes any time from accepting a ride request until the time the ride has ended in the app. Complete coverage details for our Express Drive program can be found here. Our policy is available in all states in the U.S., except for those rides originating in New York City with a TLC (Taxi and Limousine Commission) driver. Some regions may have specific requirements that modify the described coverage. We're committed to pushing the insurance industry to innovate quickly and create unique solutions for our drivers. Several personal auto insurers also offer different coverages available for transportation network drivers. Please contact your personal auto insurer for more information. If you have questions relating to insurance, let us know by tapping 'Contact Support' below. Download a copy of our Certificate of Liability Insurance, or see a list of personal auto insurers that offer coverage for transportation network drivers in your state. Lyft works with various partners, including Latitude, Travelers (Constitution State Services), and York RSG, to assist with auto insurance claims.